If you're looking to search for cards on a single board, try filtering cards on a board. 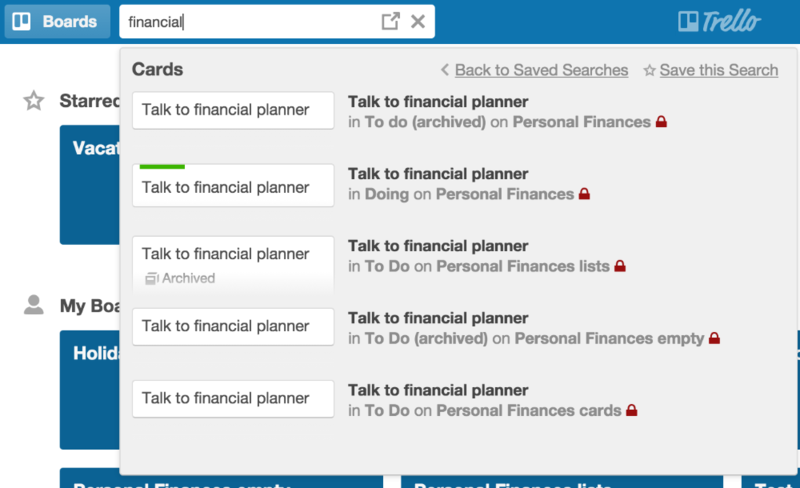 Trello gives you the ability to search for cards across all of your boards. Just type in the search box at the very top of the page to search for cards. Last created cards will appear first in the search results. Search across all of your boards. Search operators refine your search to help you find specific cards and create highly tailored lists. Trello will suggest operators for you as you type, but here’s a full list to keep in mind. These operators will also work in the "Archive" search bar. See Archiving and deleting cards for more details. -operator - You can add “-” to any operator to do a negative search, such as -has:members to search for cards without any members assigned. @name - Returns cards assigned to a member. If you start typing @, Trello will suggest members for you. member: also works. @me will include only your cards. label: - Returns labeled cards. Trello will suggest labels for you if you start typing a name or color. For example, label:"FIX IT" will return cards with the label named “FIX IT”. #label also works. board:id - Returns cards within a specific board. If you start typing board:, Trello will suggest boards for you. You can search by board name, too, such as “board:trello” to search only cards on boards with trello in the board name. list:name - Returns cards within the list named “name”. Or whatever you type besides “name”. has:attachments - Returns cards with attachments. has:description, has:cover, has:members, and has:stickers also work as you would expect. due:day - Returns cards due within 24 hours. due:week returns cards that are due within the following 7 days. due:month, and due:overdue also work as expected. You can search for a specific day range. For example, adding due:14 to search will include cards due in the next 14 days. You can also search for due:complete or due:incomplete to search for due dates that are marked as complete or incomplete. created:day - Returns cards created in the last 24 hours. created:week and created:month also work as expected. You can search for a specific day range. For example, adding created:14 to the search will include cards created in the last 14 days. edited:day - Returns cards edited in the last 24 hours. edited:week and edited:month also work as expected. You can search for a specific day range. For example, adding edited:21 to the search will include cards edited in the last 21 days. description:, checklist:, comment:, and name: - Returns cards matching the text of card descriptions, checklists, comments, or names. For example, comment:"FIX IT" will return cards with “FIX IT” in a comment. is:open returns open cards. is: archived returns archived cards. If neither is specified, Trello will return both types. is:starred - Only include cards on starred boards.